In March of 1997 Tom and Ana Lilia were surveying plants in a shady pine-oak forest canyon east of Maycoba close to the Chihuahua border. Maycoba is a town in the center of the Mountain Pima Indian area. In the Pima language, Maycoba means a snake in the agave. 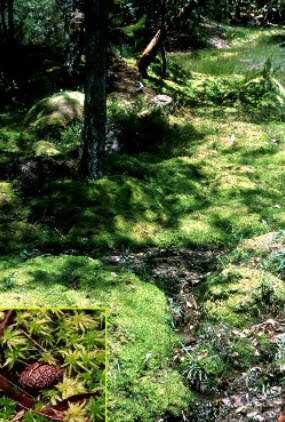 On the opposite side of the canyon, not visible from the highway, they discovered the Ciénega de Camilo, a very unusual spring covered with Sphagnum – the moss that forms peat bogs in Canada and Europe! The Camilo peatmoss was later identified as S. palustre, the type species for the genus Sphagnum described by Linnaeus in 1753 from a European collection. Although seven species of Sphagnum have been reported for Mexico, mostly in the southeastern states of Hidalgo, Oaxaca, and Veracruz, the only record from northern Mexico was a 1937 collection of S. squarrosum from near Chuichupa, Chihuahua, about 145 km north-northeast of Camilo. The Sphagnum seep in the Ciénega de Camilo in an area of 0.2 square kilometers is a unique habitat for Sonora and the northern Sierra Madre. The modern plants and vegetation have now been studied. Surveys of the flora by Van Devender and Reina with Cristina Peñalba and her student Carmen Ortega from the Instituto de Ecología- Universidad Nacional Autónoma de México (UNAM) in Hermosillo, yielded 207 species in 63 families (Appendix 4). The families with the greatest number of species are the Compositae (41 species), Leguminosae (24 species), and Gramineae (21 species). Of the species found at Camilo, 40.1% do not reach Arizona or New Mexico, 15.0% are rare or restricted in Sonora, and only 2.9% are non-native. See Van Devender et al. (2003). The Ciénega de Camilo with its unique peat habitat, diverse flora, and its paleoecological potential is in urgent need of protection. References Van Devender, T. R., A. L. Reina G., M. C. Peñalba G., and C. I. Ortega R. 2003. The Ciénega de Camilo: A threatened habitat in the Sierra Madre Occidental of eastern Sonora, Mexico. Madroño 50:187-195.